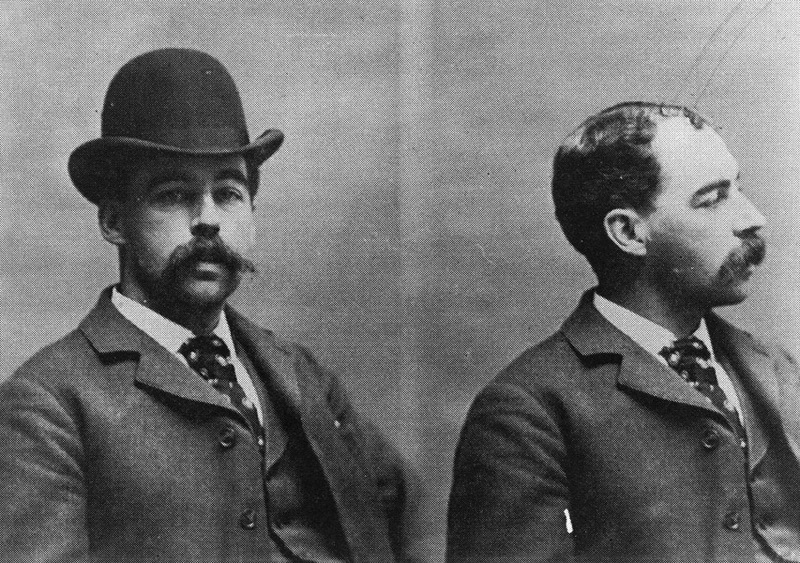 Born in Gilmanton, New Hampshire on 16 May 1860 as Herman Webster Mudgett, the man who became known as Dr Henry Howard Holmes was a serial killer with a tally of between 27 and over 100 victims. At Alton, New Hampshire on 8 July 1878 he married Clara A. Lovering. He was married bigamously on 28 January 1887 to Myrta Z. Belknap by whom he had a daughter, Lucy. Three years earlier he had graduated from the University of Michigan Medical School where he had stolen corpses, insured them, disfigured them and claimed the insurance. He turned to forging, horse theft and swindling as well as his “legitimate” business as a pharmacist in Chicago. He then got a job at Dr E.S. Holton’s chemist on the corner of 63rd Street and Wallace Avenue in Englewood, Chicago. Dr Holton died of cancer not long after and Holmes murdered his widow. Across the road from the chemist, with the money he made from his various scams, Holmes built a large “castle” in 1892, one year before the city hosted the World’s Fair. The ground floor was made up of shops while the first and second had about 100 windowless rooms. Holmes filled the rooms with lovers, clients and prospective victims, many of whom took out life insurance for which he would be the sole beneficiary. Some of the rooms were fitted with gas pipes so Holmes could poison the occupant at his whim — and he did, often. He liked to listen to their screams as they died. On 9 January 1894 he married his third wife, Georgiana Yoke. The corpses of some of his victims were sold to medical schools. Others were cremated in the two giant furnaces in the basement while many were disposed of in vats of acid. Holmes also performed hundreds of illegal abortions, sometimes with a fatal outcome. After the World’s Fair, Holmes moved to Fort Worth, Texas, and then to other states and Canada. He was arrested in Boston on 17 November 1894 when police discovered his involvement in a life insurance scam. The exact number of his victims is unknown but the police believed that he had killed 27. On 7 May 1896 Holmes was hanged at the Philadelphia County Prison. The hangman did not do the job properly and Holmes took 15 minutes to die. He asked to be buried in cement so that his body could not be dissected. A mysterious fire destroyed Holmes’s castle on 19 August 1895. The site is now a post office.